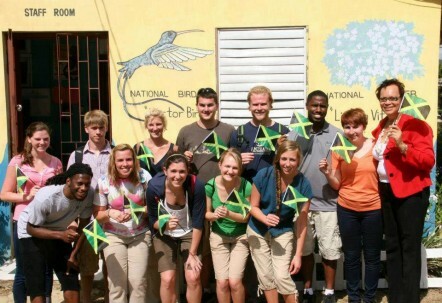 Throughout January 2013, former Amizade intern, current Slippery Rock University senior, and winner of PENNACE Student of Year, Grace Evans will be leading three different groups on Amizade Service-Learning experiences in Trinidad & Tobago and Jamaica. Follow along with her adventures here! And now I’m off – on a another plane this time across the Caribbean, to the familiar town of Petersfield, Jamaica. Having visited Petersfield for 5 days this previous May, it felt strangely like going home as we drove across the country from Kingston to the western parish of Westmoreland. This time we had a new group of students – 21 to be exact, each of whom are studying at Slippery Rock University. In addition, Dr. Bruce Orvis, professor of business marketing, served as our advisor. Our entrance into the community center in Petersfield is one that I will not soon forget – the local Gerreh band played down the street as we all marched in parade like fashion to the center for our first Jamaican dinner. Amizade’s partner in Petersfield is the Association of Clubs (AOC), an umbrella organization for seven different clubs in the region focusing on developing the community in a variety of ways. Petersfield and the neighboring town of Galloway host students year round to participate in village tourism – or what we at Slippery Rock call a Care Break. Students from Roger Williams University in Rhode Island are also in the area this week, however they are focusing on issues in autism in Western Jamaica. They stayed with house mothers in Petersfield and the SRU students were housed in Galloway. As we proceeded to our first taste of Jamaica the day of our arrival, we learned that this evening marked the Launch of the 2013 Annual Village Tourism Week – a new event that will celebrate Village Tourism and look forward to its successes and challenges in the future. The Principle of Petersfield High Schoool, the President of the local Chamber of Commerce, the Counselor, and the Honorable Mayor were present, among other distinguished guests. These stakeholders were positioned at the head table, while the rest of the center was packed full of 21 Slippery Rock students, 14 Roger Williams Students, and many, many community members. We ate a delicious dinner that was followed by a program. Each of the distinguished guests spoke regarding the importance of Village Tourism and of Petersfield’s successes in this area. The professor from Roger Williams was asked to speak as was I, during which I thanked each person and organization who was able to make Village Tourism happen. While not nearly as long winded as many of the other guests, I believe that I made my appreciation clear. This evening was certainly the first taste of culture shock for the participants from Slippery Rock University. They handled it very well – many were asking “Where did our luggage go?”, “What time are we going to our house mother’s?”, and “What are we doing tomorrow?” – and after many “I’m sorry, I’m not sure yet”-s from me, they were happily enjoying themselves, not caring what time it may be. Within a day or so, our students fully adjusted to island time. While there were a few concerns regarding what our schedule looked like for the following days, most were happy to go with the flow and used Amizade’s “Okay, good” philosophy. We are being housed with different house mothers in Galloway. Michelle and I are with Mrs. Kasantaroeno, the principal at Coke’s View Primary School in Galloway. Other groups stayed with Mrs. White, Mrs. Wright, Mrs. Palmer, and Mrs. Fenton. All seven of our male participants were at Mrs. Fenton’s – who they swore was the “best” house mother (mainly due to their competitive nature) and soon had nicknamed their home as the frat house. Mrs. Kasantaroeno made our stay very, very comfortable and was too nice, as the AOC house mothers tend to be. We’ve eaten Jamaica’s national dishes of Ackee and Saltfish, we’ve eaten Curry Goat, Jerk Chicken, and many other delicious dishes. Each morning and evening, what we ate for the previous meal is always a hot topic amongst the SRU students. We took a group of 12 students from the University of Wyoming to this same site and had a phenomenal experience. I cannot say enough about the hospitality, accomodations, homestay mothers and of course Mr. Brown!